I've seen the recipe for these biscuits everywhere lately. I'm not surprised, because these are so easy and the resulting biscuits are delicious! The recipe I used was out of Nathalie DuPree's Mastering the Art of Southern Cooking, but like I said before, if you google it, there are dozens of sites out there with recipes. 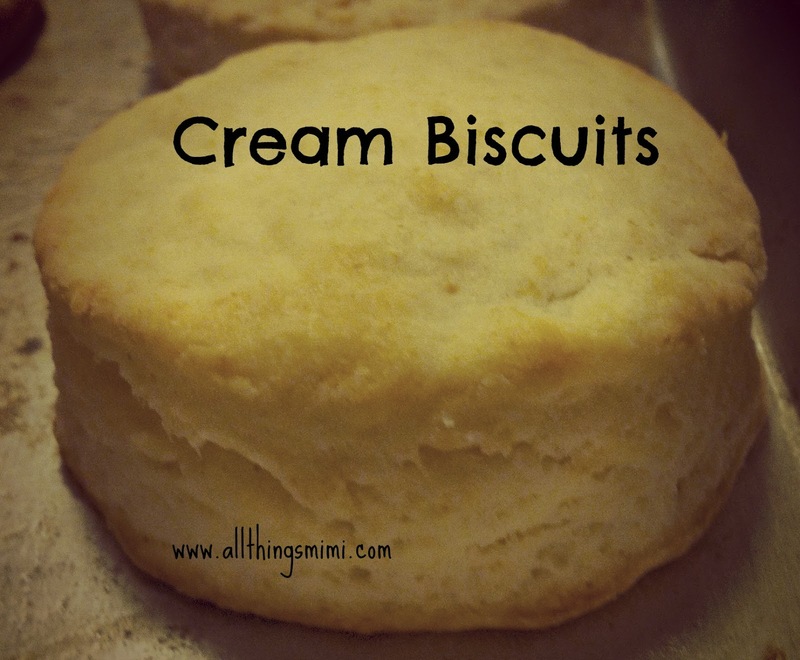 The allure of this recipe is that it only uses two ingredients- heavy cream and self rising flour. That's it. I had to play with the recipe a little because I am in a much drier climate than Ms. Dupree, therefore I had to use almost half again as much cream to get my dough to come together. I put these biscuits together in about 5 minutes, including the cutting. They baked about 12 minutes. That's home made biscuits in about 15 minutes- crazy! In a large bowl I mixed 2 cups of self rising flour. I made a well in the center, then slowly poured in 1 cup of heavy cream. After folding it in very carefully (NEVER over mix biscuit dough! ), I realized I needed more cream. I used about a half cup more. When the dough starts to come together in one big lump, tump it out on a well floured surface. The directions said pat it out and fold it over. I was afraid my dough would be overworked, so I skipped that step and went right to patting it out until it was about 1/2 an inch thick. Then I used a 2 inch biscuit cutter and cut out 14 biscuits (that included gently putting scraps back together for the last 4 biscuits)- don't twist the cutter while you punch them out or the biscuits won't rise properly. I put them on a buttered cookie sheet and baked them at 450 degrees for 12 minutes, spinning the pan half way through. If you want softer biscuits, crowd them together in a pan. I wanted biscuits that were crispy on the outside. When they come out of the oven, slather them generously with butter. Try not to eat one standing at the oven. I dare you! Possible variations- you could add chives and cheddar to the dough, smoked gouda and ham, any herbs, garlic (or slather the tops with garlic butter when they come out of the oven). I think to make an even crispier biscuit, next time I'll baste the tops with melted, salted butter before I bake them. It doesn't matter what you do to them- just make them!